In 1992 Emerson, Lake & Palmer celebrated their come back with the album Black Moon (see review) and only two years later there was a follow up called In The Hot Seat. 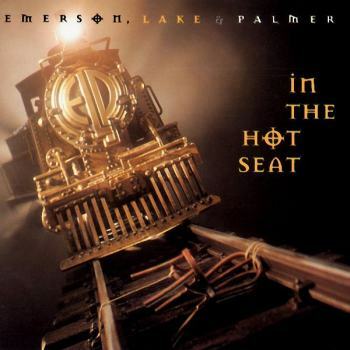 Originally the ninth studio album of ELP was called The Best Seat In The House, but they changed it to In The Hot Seat for no really obvious reason. In The Hot Seat is the last ELP studio album and the 10 songs are a blend of mainstream rock, classic ELP progressive music, melodic pop and ballads. Black Moon was a far better album as In The Hot Seat in fact only features two great ELP worthy tracks, namely the opening track Hand Of Truth and the emotional song Daddy. The latter, a heartfelt narrative ballad, was based on a true story and the song was composed by Greg Lake. Hand Of Truth, originally entitled We Have The Power, features an excellent classical ELP overture played by the late Keith Emerson, followed by Lake's excellent vocals and Carl Palmer's outstanding drumming. The other eight tracks do not really impress me as they are mainly too poppy or too soft. CD2 of this remastered version features 12 songs from the Now Tour of 1997/1998 and among them are excellent pieces of ELP highlights like Knife Edge, Lucky Man, Karn Evil 9 and a superb version of Fanfare For The Common Man/ Rondo which clocks over 22 minutes. Therefore this album is still a must for ELP fans! !